Pressure is sometimes a dirty word. Sure there are times where there is too much or too little, but with everything else, when there’s just enough, great things can happens. With the right amount of pressure, time, and carbon, we get diamonds. With focus and time we get brilliant results. This brings us to this week’s PowerPose, Bhujapīdāsana or Shoulder Pressure Pose. Another wonderfully awkward posture, this arm balance requires a strong foundation of the hands, open hips, and Uḍḍiyāna Bandha. According to Iyengar in Light on Yoga, “The various parts of the body supply the weights and counterweights. All that is needed is strength of will.” That strength of will can be explored with focus and time. Option 1 – Bhujapīdāsana Prep. Forward fold with the feet just wider than hip distance. Soften the knees for maximum fold. Reach the hands between the legs to the ankles and use them for leverage to shimmy the shoulders behind the knees. Walk the feet closer together, a left to right rocking motion may facilitate this. Slowly lift the hips as you gently squeeze the knees into the shoulders. Keep the collarbone as open as possible. Engage Uddiyana Bandha, the energetic lift that starts with the up and in muscular lift of the belly. Option 2 – Sit Back. Place blocks behind you. Reach the hands to the blocks. Draping the fingers over the edge can promote comfort in the wrists as they build strength and mobility. Bend the elbows to create a shelf, as you do slide the hips back to rest on the shelf of the triceps. Lift through the belly, keep the heart reaching forward. Start to bring the toes together to touch. Explore the weights and counterweights of the body. Option 3 – With Blocks. Keeping the thighs on the triceps or on the shoulder, cross the legs at the ankles. Balance solely on the hands. When the wrists are ready, remove the blocks and take the hands flush to the mat. It is common to fall back and land on your tail and it’s an important step to learn this balance. Switch the cross of the ankles as you practice to promote symmetry. Option 4 – Bhujapīdāsana. When you are able to keep your balance, begin to press the ankles together and reach the feet long. Imagine that the legs can go completely straight. Be mindful not to collapse the shoulders under the pressure of the legs. Work to find the perfect balance of contraction through the belly and expansion through the legs and heart. 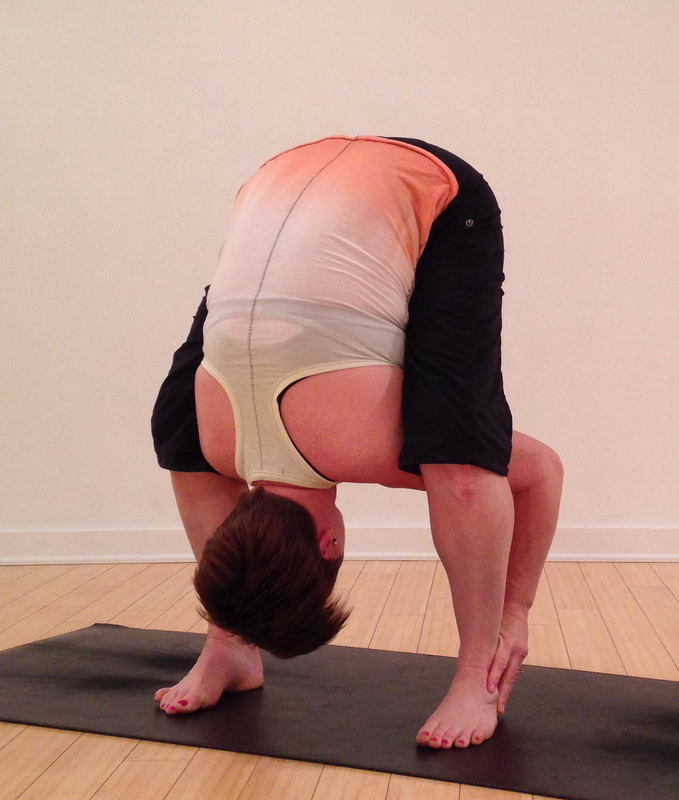 To come out of the pose shift forward, releasing to a forward fold. There comes a point in asana practice where it’s less about flexibility or form and more about the “strength of will”. Showing up to practice, taking the practice off the mat, and then getting up and doing it again and again is a true measure of strength. It’s not about if you can get into these wonderfully awkward shapes. That just makes it all a little more interesting. As you test and strengthen your will, work where you are safe and at the right level of challenge for you. Follow this #PowerPose challenge @suzannewrightyoga on Instagram or at Suzanne Wright Yoga on Facebook. If you post your pictures or about your experience be sure to tag #PowerPose and @suzannewrightyoga. You are once again amazing!